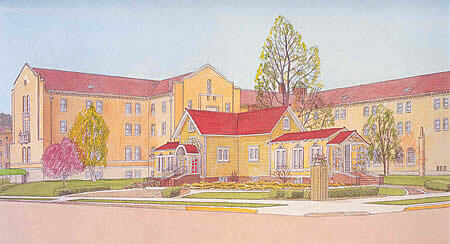 To preserve the history of the College of Saint Teresa as a major part of the history of the City of Winona and Saint Teresa Campus Schools. alternatives to established women’s studies programs. The Tea House’s future was uncertain, and a group of dedicated CST alumnae wanted to be sure we could preserve the Tea House building as a piece of our history on campus. Four Teresans, including Fran Bowler Edstrom ’67, Ann Patterson Gibson ’69, Sue Schlink Edel ’69 and Sharon Erickson Ropes ’76, wanted to make this happen. Funds were raised and the Tea House was gutted in 1994 preserving the original windows, doors, fireplace, and tile floor. All new electrical wiring, roof, sheet rock, heating, and air conditioning were installed and the building was ready for use. Over the years, the Tea House has been rented out as a meeting space, hosting showers, anniversary parties, campus tours, and concerts. In 2001, the Alumnae Association Office moved to the Tea House building which has helped keep our history alive and well.